The Tampa Bay Lightning understand what it takes to be successful in the Stanley Cup playoffs. 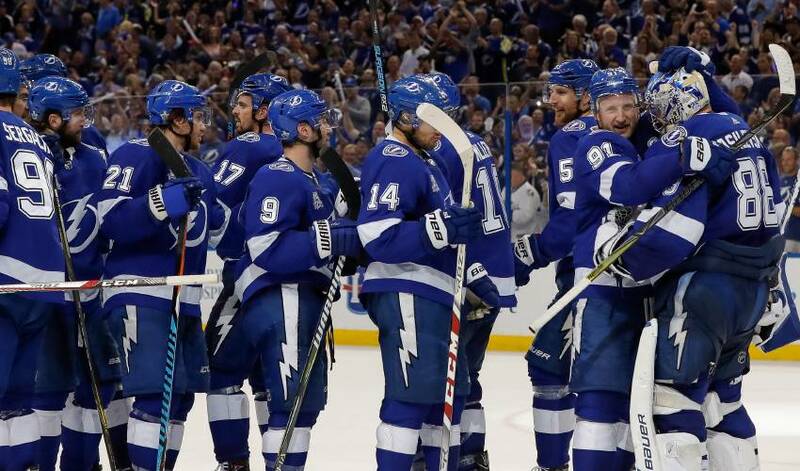 TAMPA, Fla. — The Tampa Bay Lightning understand what it takes to be successful in the Stanley Cup playoffs. "People are going to look at this series and say: 'Oh, 4-1. Tampa took it to them.' Anybody that was actually watching these games knew clearly that's not what happened in this series," Cooper added. "It was fought from the drop of the puck to the end. We just happened to get big goals at the right time." Nikita Kucherov scored his 27th career post-season goal and Andrei Vasilevskiy stopped 26 shots for the Lightning, who advanced to a second-round matchup against either the Boston Bruins or Toronto Maple Leafs. Kucherov, the NHL's third-leading scorer during the regular season with 100 points, had five goals and five assists in the five games, setting a franchise for points in a playoff series. He also tied Vincent Lecavalier for second-place on the club's all-time post-season scoring list. The goalie, who lost his starting job after being injured in January, stopped 35 of 37 shots, including Tyler Johnson's breakaway that kept New Jersey within striking distance after Patrick Maroon trimmed Tampa Bay's lead to one goal with three minutes left. Will Butcher and Taylor Hall assisted on the only goal for New Jersey, which played without injured defenceman Sami Vatanen. Notes: The Lightning was 0-for-10 on the power play in Games 4 and 5, yet won both games. ... Vatanen, New Jersey's top defenceman, was injured during the opening period of Game 4 when he was checked high by Kucherov. The Devils also played without RW Stefan Noesen, who was scratched with a lower-body injury. ... Callahan (upper body) returned after missing Games 3 and 4. "It's always tough watching your team play, especially in the playoffs," he said. "To be able to get back out there and play was big." Note to readers: This is a corrected story. A previous version listed an incorrect goal scorer.